Since this is a non-fiction and educational book, I'm not going to worry about inadvertent spoilers as I usually do with fictional, or even narrative true-stories. This book does have a narrative flow, better that a lot of the fiction books I've already reviewed, but it is the narrative flow of a documentary, moving from subject to subject, building knowledge. Neil deGrasse Tyson is one of the top science communicators alive today. And this book, physically small, is only about half the reading of another book with the same number of pages. It took me about a week to complete, and I definitely read non-fiction books much, much slower than I read fiction. This is as close to a page-turner of a non-fiction book as I've read since I read the Quark and the Jaguar, around 7 years ago. This book starts with chapters titles that invoke biblical parallels. Chapter one, The Greatest Story Ever Told, covers the big bang, introducing Plank and leaving me with many, many questions about the speed of light and how it's rules applied to the earliest moments of the universe. The book then covers Isaac Newton's discoveries about gravity, and specifically the universality of gravity throughout the solar system, but thankfully avoids describing calculus itself. Moving back to the forming of the early universe, it covers the Cosmic Microwave Background and its origins. The next three chapters cover the space between galaxies first establishing the basics then introducing us to Dark Matter and then Dark Energy. At the point where I was reading about these, my questions surrounding the limitations on the speed of light were still reeling in my head, and all this measured "extra" is a lot for my little brain to take in. Chapter seven, The Cosmos on the Table, explores the stellar origins of the elements (those of the Periodic Table), which for me was a very welcome break from the abstract. Though not repeated in this book, it reminds me of the Carl Sagan quote, "We are all made of star stuff." The next two chapters talk about Spheres and Invisible light. The stability of spheres as well as how rotation has a tendency to flatten a sphere into an oblong spheroid seems meant to explain the general shape of galaxies. Invisible light is a useful introduction to the instruments of modern astronomy beyond the visible-light telescope, including how each was discovered and how they are used. Between the Planets, the 10th Chapter, tries to put into perspective how little the constituent parts of our solar system are in comparison to the Sun while Chapter 11, Exoplanet Earth, explores what our planet would look like from other stars and what methods might be used to figure out that there is life here. 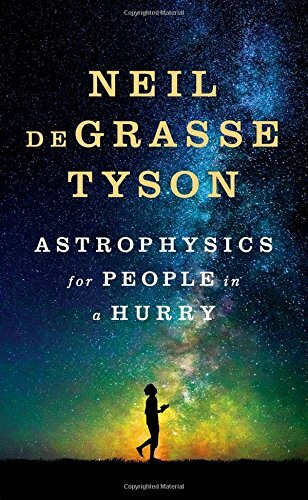 In the 12th and final chapter, Reflections on the Cosmic Perspective, Tyson clearly shows that he is a disciple of Carl Sagan, linking the study of the Cosmos to the importance of stewardship of our tiny and fragile planet, while fostering a hopeful view on what we could accomplish. This is a very good round-up of the book. Overall, I recommend this book if you found this review itself to be interesting. If, on the other hand, you generally find space to be an invitation to sleep, then it's okay to skip. I am glad I read it. Note to my readers (all three of you). Summer (and summer reading) is over, and I'm going to do my best to keep up this blog, but I'm moving to an every-other-week schedule. The next book review, North American Lake Monsters, will be posted on Wednesday, 3 October 2018.